Today I’ve got an extremely colourful outfit to show you; in fact it’s pretty hard to think of a colour which doesn’t appear in these pictures. I love this skirt so much. I’ve tried to show it on my blog many times before but the photos never turned out very well for a variety of reasons. 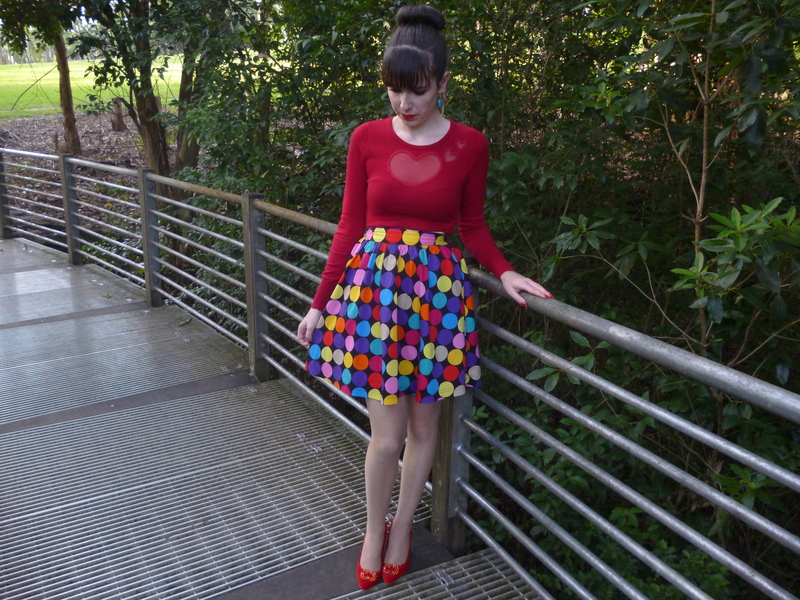 I’m happy to can finally display my rainbow polka dot skirt. It’s my ultimate dream skirt. I was very excited when I found it in Dangerfield last year. It instantly brightens up the day. I definitely believe there should be more rainbow clothes around; whenever I see rainbow pieces I pretty much always buy them! I also wanted to show you my new coat which I received during the week courtesy of OASAP. I am so happy with it, it’s absolutely perfect. I wasn’t sure what to expect with this coat and I knew I was taking a risk when I ordered it. It’s so often difficult to tell the quality of coats when purchasing them online and it frustrates me when stores attempt to pass off long shirt style pieces in light weight materials as coats. However, this wasn’t the case with my OASAP coat at all. It is of excellent quality and is beautifully warm. I love the style. 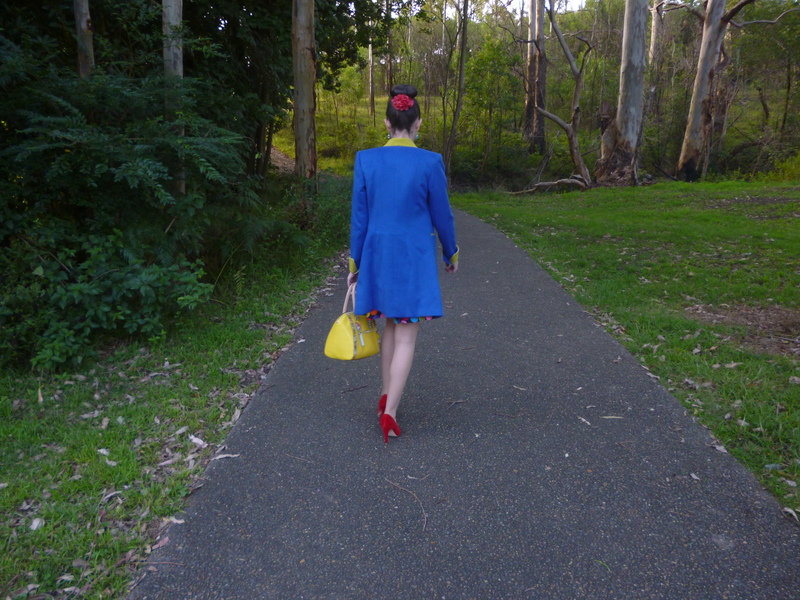 The cobalt blue with the yellow accents is so lovely and I especially adore how the back of the collar is yellow. I’m particularly pleased with the structure of this jacket. I usually don’t wear blazer style jackets because they look bulky on me; that’s why I always opt for cardigans instead. This one works because the length streamlines the blazer style which makes it an amazing coat. I’ll definitely get so much use out of my new coat and it’s quickly become one of my favourites pieces. Thanks OASAP! 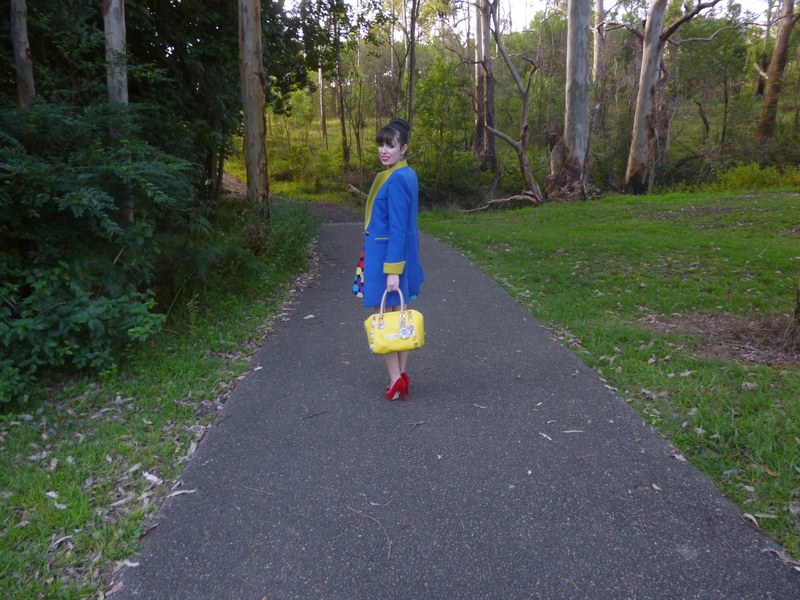 In other news I have finally fulfilled my desire to own a yellow bag by sneaking in a little purchase recently. There are some lovely yellow bags in Guess and it was even better when this one, which I’ve had my eye on for months, was half price. I love the detailing, the shape and the bold tone. It makes a fabulous and happy addition to so many outfits. 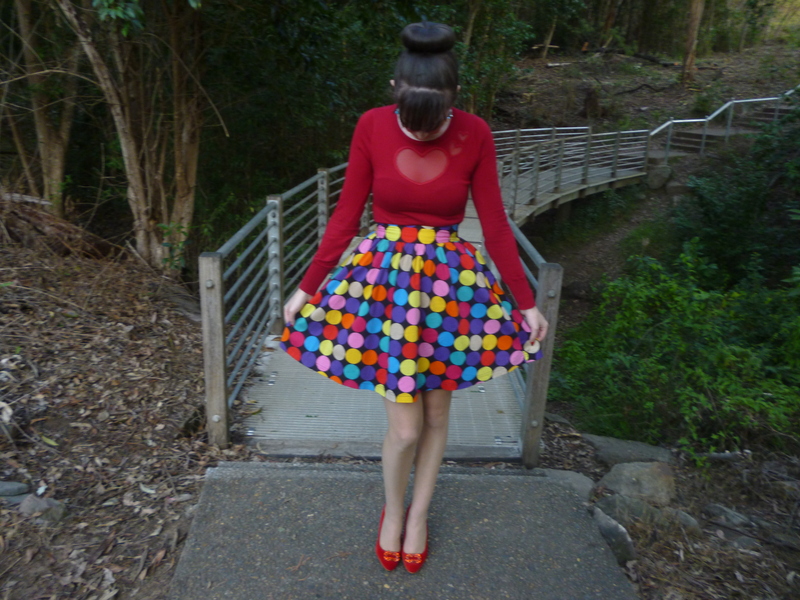 This skirt is very versatile and I often style it with pink but I went with red this time because I wanted to wear this particular top from Alannah Hill. I adore the heart detailing; it’s such a sweet and adorable detail. It’s amazing how much this little addition adds to a whole look. It’s such a fun little top to wear. 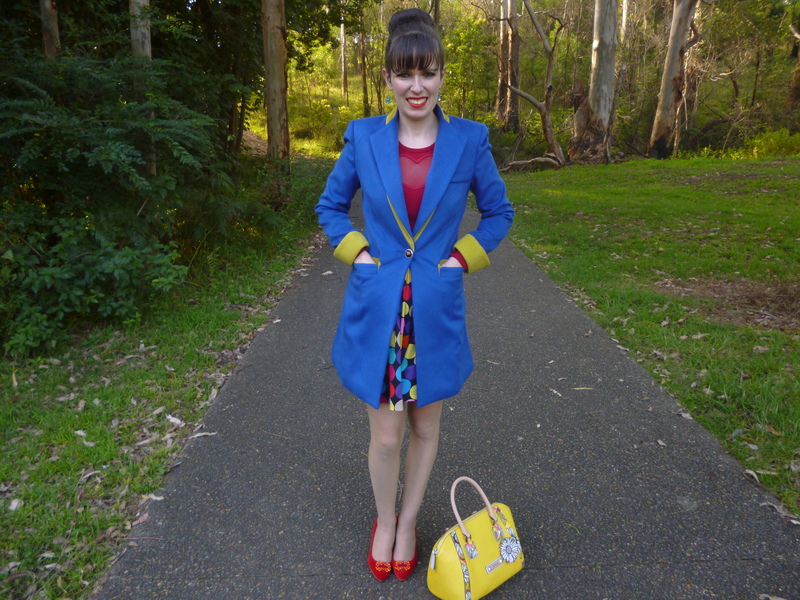 I love how this look features all three primary colours. I must say I’m absolutely shocked and devastated by the news of Australian television personality Charlotte Dawson who was found dead in her Sydney apartment this morning. It’s hard to believe that the bold, confident and tough character we saw on Australia’s top model was actually very vulnerable and suffered a long battle with depression. We never really know what goes on in anyone else’s mind. This struck a chord with me because I know what it’s like to feel hopeless and to fight personal demons every day; it’s tough and requires enormous strength. I just wish, beyond what words could explain, that she could have found the power and strength to go on. I know so many people admired her and it is such a tragedy the way the events unfolded. RIP Charlotte. Never forgotten. Let’s all be kind and support each other. This entry was posted in Dangerfield, Florsheim, Guess, Outfits, Uncategorized. Bookmark the permalink. You do look great in red, girl! love the bright colors. so fun and great transition into spring. 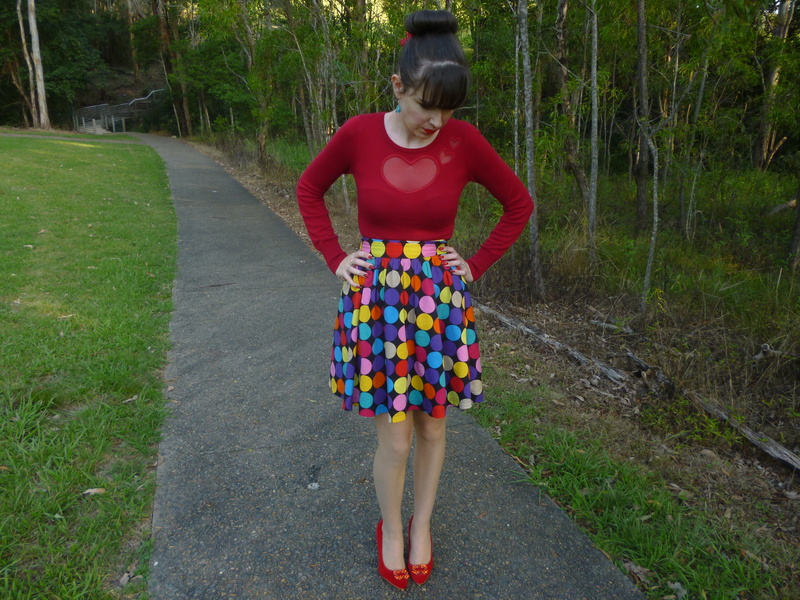 the polka dot skirt is really cute and i am so into that heart top! Oh wow this is by far one of my favorite outfits from you! I love all the colors. This is such a fun outfit! It makes me excited for Summer. 🙂 I was really sad to hear about Charlotte too, people can be so cruel. Ah yes this is a colorful look but so well done! And love the bag, it is so cute. I love the colorful polka dots and the cut-out on the cutsew, it's so cute yet subtle! You have the cutest clothes, Imogen. I get so much inspiration from you. I love that yellow purse, and the red heart top is sweet. I hope you are having a fun day. You are so bright and cheerful with your bold use of color and prints. Love it! And thanks for linking up with Manic Monday again- always glad to have you! That coat is perfection. 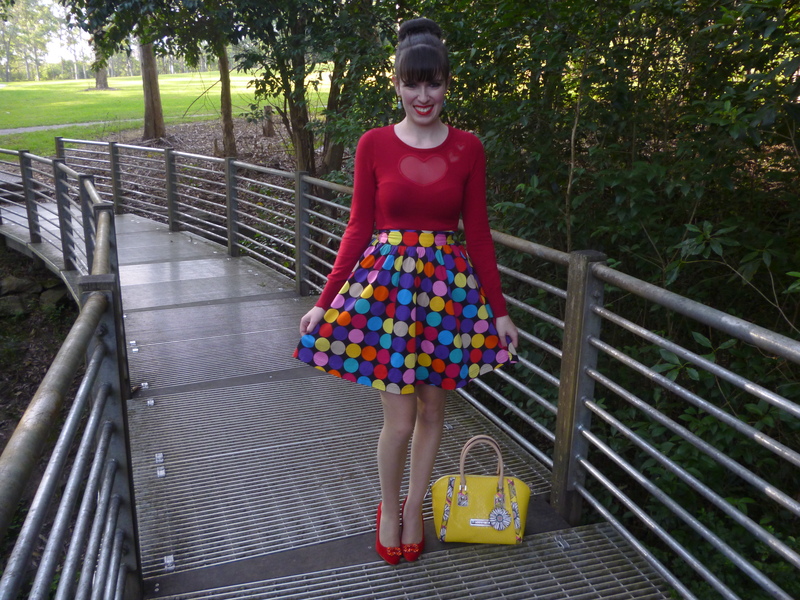 And I really love the dotted skirt too, very fun! I LOVE the heart detailing on that top!! What a beautiful outfit! I really am loving all of the colors, so pretty! I love the kinda cut-out of that shirt too! This outfit is gorgeous Imogen and you look so lovely in it. Sad news about that girl – always sad to hear of another person dying too soon. Hope you're well! 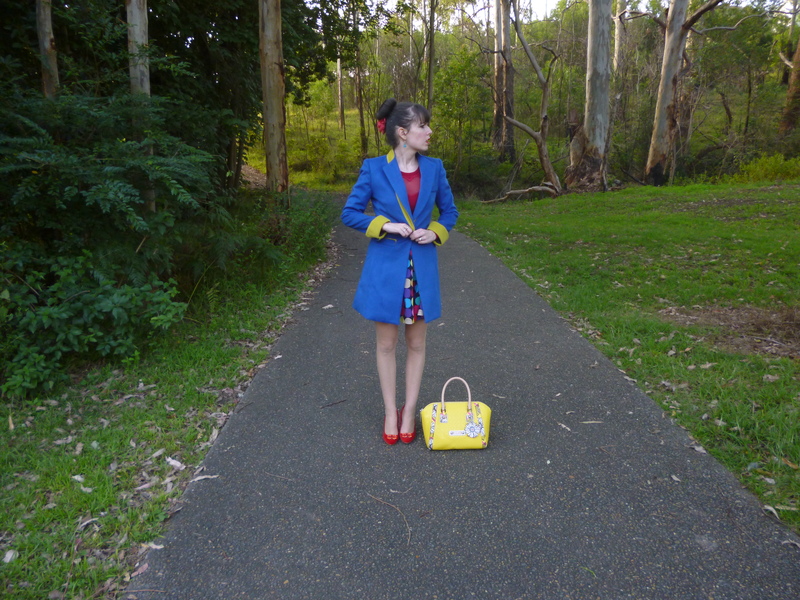 But completely opposite – loving the primary colors! Great pops – so fun! I appreciate your support with Manic Monday! 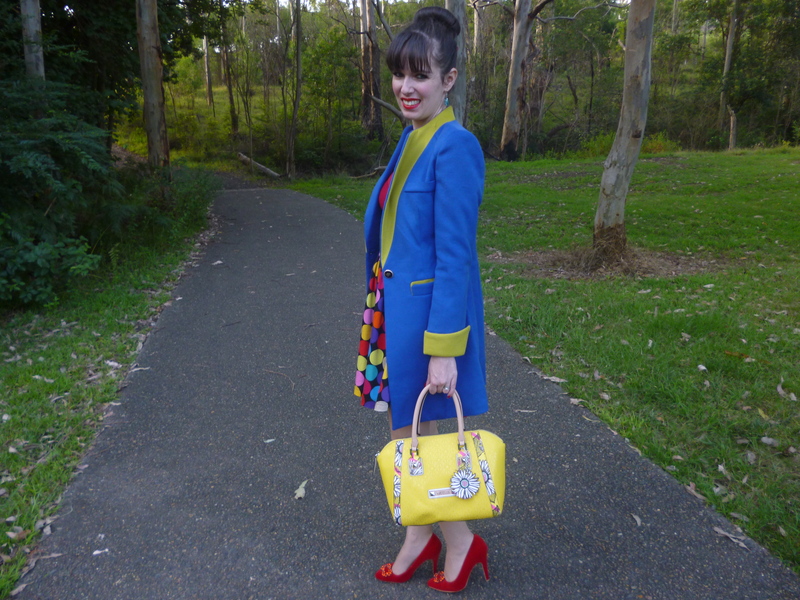 I adore this beautiful colorful look! 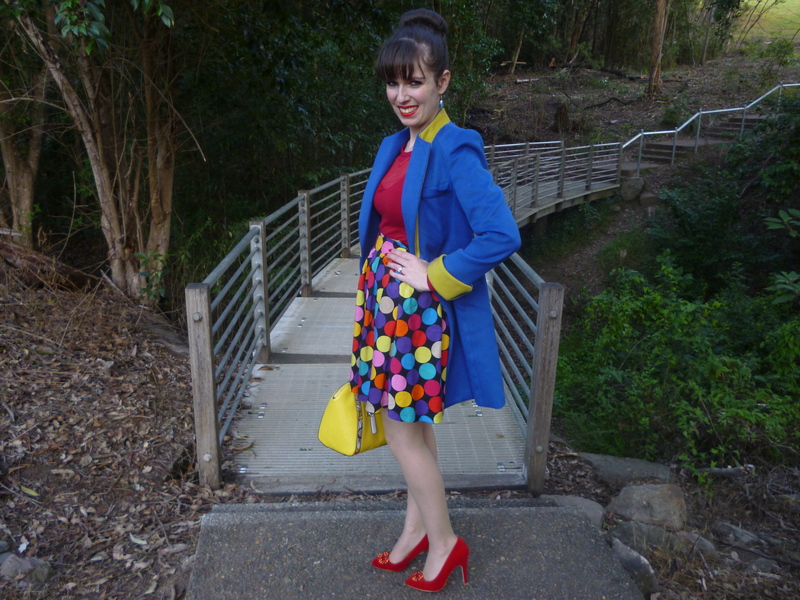 That skirt is perfect and your coat is just a fun piece! The color mix is superb! Charlotte was special and she will be missed. omg that skirt is so cute! Wow adorable from top to bottom. I love everything about this beautiful spring look. Esp. the classy coat and the cute skirt! Wow…. this mix of colors is TERRIFIC!!!!! I want your skirt and your coat in my wardrobe now!!!!!! you are so beautiful, what a great colorful dress!! I can never pull off those colours and the way you did your bun!! I have such a hard time getting to look like yours!! I can't even begin to describe how fabulous this is! The whole disco chic look, that skirt is to die for! I love your top !! What a gorgeous color explosion! That skirt is so unique! I adore how you always dress so colorful and happy!